Peaches. I can’t seem to get enough of them (and, it seems, all other stone fruit) this time of year. Maybe it’s my semi-new status as a Georgia-adjacent-state resident (read: Florida). Or perhaps it’s because their sweet, summery smell is just impossible to resist whenever I wander through the produce department. Regardless, this salad is a spectacular way to showcase their flavor beyond in the usual cobbler. Inspired by a seasonal special at one of my favorite restaurants in downtown Orlando, The Strand, this salad takes a bed of mixed greens to the next level with a Southern-inspired assortment of sweet, salty and tangy elements. 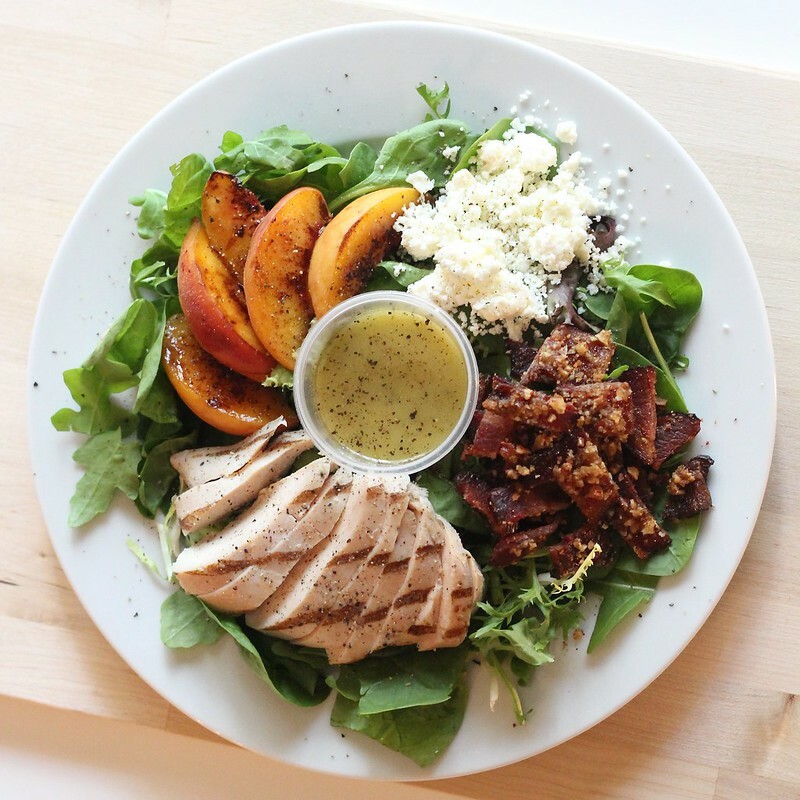 A generous amount of grilled chicken and sauteed peaches, along with homemade pecan praline bacon and crumbles of feta create a textural (and flavor) experience that’s beyond compare. Talk about a wonderful, substantial salad for celebrating the end of summer! What’s your favorite sweet or savory way to enjoy peaches? Let’s talk in the comments or on Facebook! Mix together brown sugar and chopped pecans in a small dish; set aside. Line a small, rimmed baking sheet with nonstick aluminum foil (or regular foil with a sheet of parchment on top). Arrange bacon slices on sheet pan. Place pan in oven and set to 400°F (do not preheat oven!). Cook for about 30 minutes or until browned in spots and cooked through, but still chewy/wiggly. Remove pan from oven, transfer slices to paper towels and pour off bacon grease from pan (replace parchment with a fresh sheet, if using). Return bacon to de-greased pan and sprinkle sugar-nut mixture evenly over slices. Place in oven, and cook for about 10 – 12 minutes or until caramelized and crispy. Set aside to cool. 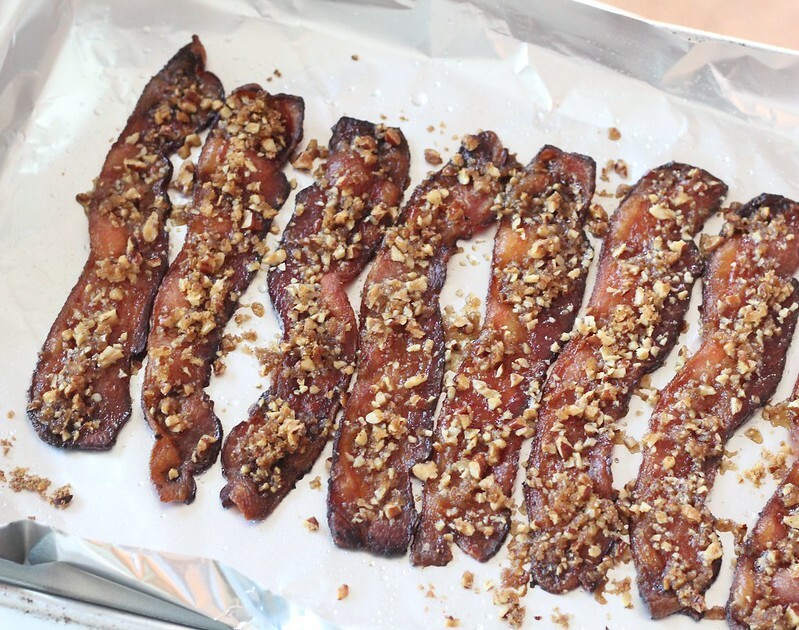 DO AHEAD: The praline bacon can be made several days in advance. Refrigerate slices in an airtight container for up to a week, or even longer (months) in the freezer. Lightly grease a small, nonstick skillet (or well-seasoned cast iron pan) with a thin layer of bacon grease or olive oil; set over medium-high heat. Once hot, arrange peaches in a single layer and cook, tossing occasionally, until lightly browned on each side (just a couple minutes total). Transfer peaches to a heatproof plate to cool slightly. Toss greens with about half of the dressing until nicely coated; divide onto two large plates. Divide the remaining ingredients evenly between the salads. Serve immediately with remaining dressing to drizzle over top. Heather I am OBSESSED with praline bacon after I had for brunch a few weeks back and have failed at all attempts of making it- Giving this a try and perfect timing before peach season disappears! 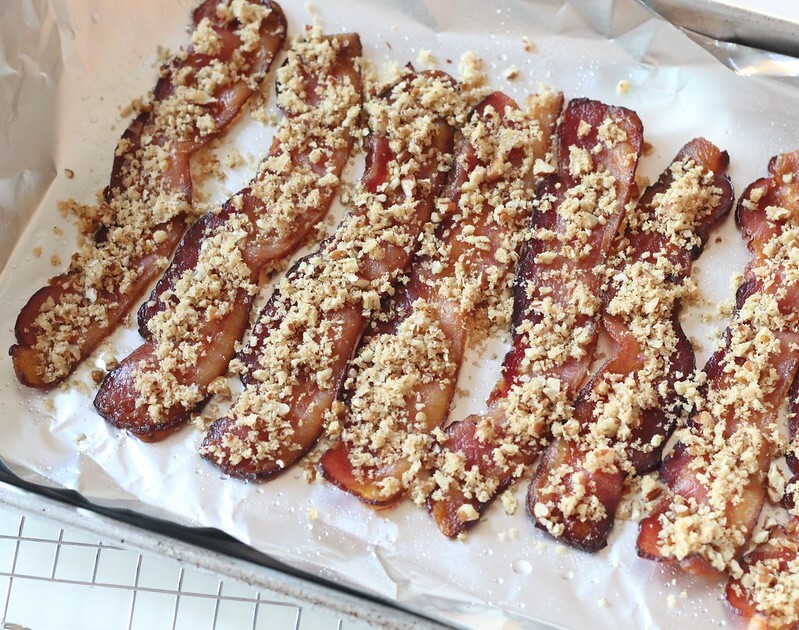 Glad to hear I’m not the only one who’s totally taken by its sweet-salty ways 🙂 Hope this method results in the praline bacon you’ve been craving!